Every E3 conference has that one behind-closed-doors gameplay reveal. The one that combines holy-cow gameplay, how’d-they-do-that visual trickery, and the mystique of hiding behind an “industry-only” shield. The one that sets tongues wagging. This year, CD Projekt RED’s long-awaited Cyberpunk 2077 has arguably claimed that buzzy throne. After a wild, brief tease in 2013, the William Gibson-inspired, near-future RPG went into hiding, but it has emerged at this year’s E3 to answer many questions—and to inspire another zillion. One thing is for sure: this ambitious game, which currently has no release window, doesn’t resemble CDPR’s famous work on the Witcher franchise in the slightest. We opted to only share images from the game’s gussied-up trailer that actually resemble what we saw in the hands-off demo. The protagonist V lives in this sprawling apartment complex, which resembles modern-day LA buildings, though with grimy, tech-loaded tweaks like broken biometric scanners on people’s front doors. The game’s opening mission sees you rescue an apparently high-ranking civilian from a kidnapping ring. Insurance in Cyberpunk 2077 seems to revolve around private companies showing up with military squads and medical personnel to help LA’s elites. In the demo, V finds and makes an offer to this rich, powerful “corpo” character. A dangerous mission follows in which everyone seems to stab everyone else in the back. Frankie is V’s accomplice during the demo and offers a lot of chatter and dialogue-tree options for V to pick through. I can’t emphasize that point enough. The same developer behind Geralt’s brooding, sword-and-magic adventures has now emerged with a first-person, shotgun-crazy, branching-narrative, hack-the-world, exploding-limbs dive into the criminal underbelly of near-future Los Angeles. We already assumed, based on the franchise and earlier teasers, how different the setting and stakes would be compared to The Witcher, but that difference feels many times larger after the demo. The 50-minute demo’s sales pitch is as follows: you star as V, an augmented, cyberspace-savvy, gun-wielding mercenary in an alternate-reality version of LA. (Our version of V was a woman, but players can pick either gender.) The demo starts with V in the middle of a work-for-hire gig to rescue a kidnapped VIP, then has her walk through a city, pick up some upgrades and missions, and drive to a fortified compound to take on a high-level mission. Structurally, you’ve seen this kind of futuristic RPG before… as in, Deus Ex. Cyberpunk 2077 diverges from that series in a few major ways, and the first is with brutal high-speed gunplay. This is a first-person shooter, full-stop, as played through the lens of bio-enhancements and high-tech, black-market weaponry. In one brutally impressive example of the C2077 difference—an answer-in-execution of why the Witcher team swapped to twitchier first-person combat—V pulled up a heat-scan interface, saw a foe through a wall, and used her high-tech HUD to map the trajectory of her buckshot’s ricochet. Our demo’s host pulled the trigger, and our shot bounced perfectly off a corner and filled our foe with lead. CDPR didn’t reveal or hint at anything like Fallout‘s “V.A.T.S.” time-slowing system or Deus Ex‘s freeze-and-strategize tactics. Instead, you can occasionally slow time by huffing something that looks like an asthma inhaler. Doing this triggers a Matrix-like time slowdown in the middle of combat (which you can trigger within roughly one minute of that inhaler dose). CDPR says “smart” guns can eventually be picked up to auto-target foes, but the gameplay slice we saw focused largely on real-time, first-person combat that rewarded precise aiming with, in some cases, blowing legs and heads clear off victims’ bodies. Near the end of the demo, another “slow” combat option emerged because our player had put experience points into an “engineer” path. This meant that V could hack into the brain of a security guard, which she used to open doors and access other guards’ skills and inventories (you can do that when you’re in a compound that’s religiously devoted to a new life of body augmentation). She stood on a high-up girder, scanned two guards, and saw she could plant a virus into one of their weapons. After doing so, she jumped down and took out the second guy, then watched as the first one struggled with his weapon. Bang, bang. The game’s press-only information brochure, captured for your reading pleasure. What if you hate first-person action? Instead of giving future-war criminals a simpler, menu-driven alternative to combat, Cyberpunk 2077‘s demo tried to show the kinds of alternate, seemingly organic paths that a player can take based on how they build their skill tree. We didn’t get a lot of explanation about “cool” and were repeatedly told that all of the RPG-molding menus and options are subject to change. But our demo revolved around “charisma”-style approaches, and it emphasized conversation trees as a true driver of how gameplay might turn out. Every few moments, V and her accomplice, a vulgar mercenary named Frankie, had 2-3 dialogue options pop up. Whether chit-chatting with each other on their way to a mission, confronting a new NPC, or offering dialogue while holding a gun to a foe’s chin, V always had a variety of intense and clear extremes as options. In one instance, V took on a mission to confront a corporate ringleader (dubbed a “corpo”) by finding her via a city-scanning interface and… just walking up to her in the street. No stealth attack, no combat, no sneaky use of a drone or hack to make this corpo drive to a safer location. We pulled up our big-girl pants as V and offered our own mercenary duties while the corpo’s goons aimed guns at our heads and tried (unsuccessfully) to hack our minds. Roughly every nine seconds, a dialogue option appeared that could escalate the showdown, but our demo’s handler stuck to the cooler road. What’s more, I noticed multiple instances in which the demo’s handler did the “press A to skip dialogue” thing that you and I might do when we’re itching to get into our favorite games’ action. That’s how dialogue-dense this 50-minute demo was. In my 22 years of on-and-off gaming journalism, this is the first time I’ve seen a games company skip its own dialogue this way, and I still came away from the demo absolutely floored by the depth and repartee afforded by all of the dialogue between various toughs. CDPR cast a few laughably over-the-top actors for its characters, particularly the awkward Spanglish spoken by Frankie, but they at least maintained a tolerable and consistent tone of badasses trying really hard to be badasses. One reason the demo will be remembered for a long time is because it teases two possible gaming generations: the current one, and the next one. Many of the game’s action and dialogue sequences could have been taken from a PlayStation 4 in terms of handsome-yet-efficient effects pipelines and polygon budgets. Gunfights may have been draped in tantalizing lighting and texture work, but 2018 games like God of War are good reminders that this generation of consoles is still capable of such visual surprises. In fact, I optimistically typed in my notes after the first gunfight the following: “This could be real gameplay!” That indoor gunfight’s combination of 30fps action and dramatically staged encounters—particularly the moment where you have to pull a naked woman out of a bathtub, since her augmentations have been cut out and harvested by kidnappers—looks less about teraflops and more about bold artistic direction. Tons of flashy “augmented reality” menus appeared throughout the demo, sometimes to emphasize gunplay possibilities and other times to tip us off to names, backstories, and personalities while walking around the city streets. (Think Watch Dogs, only with hints of more Witcher-like conversation possibilities with those NPCs.) These menus oozed style with simple, dramatic pop-up animations. In spite of some of the demo’s current-gen feasibility, other spectacular moments in the demo gave me utter pause. When bullets explode and whizz through a wall—a cool moment that emphasizes promises of destructible environments—they’re followed by incredible, dusty rays of light. When V rides in a crime lord’s car, depth-of-field and reflection effects drench the dense, varied scenery whizzing by through a car window in one of the most cinematic car-ride sequences I’ve ever seen in a game demo (real-time or CGI). That’s nothing compared to the audible sound of 60 demo-watching jaws simultaneously hitting the floor when V finally stepped into the full streets of Night City for her first time. The number of detailed, varied, and stylish people walking around these streets, all animated in decidedly different ways and organically interacting with each other, was staggering. These weren’t animation or outfit clones, either, as the game’s bold leather-and-plastics neo-hipster style emphasized. My feeling was only amplified by the dense apartment towers surrounding the scene with even more people in the near distance. The whole thing looked like it required no less than three times the rendering budget of Witcher 3‘s demanding Novigrad City sequence. On the way out of the demo, one CDPR developer dodged my question about target platforms by saying that the company “wanted to put this game in front of as many players as possible.” I wanted to respond by pointing to that specific city-walk experience and talking to him about animal excrement. You show me a PlayStation 4 that can render that sequence without choking, and I’ll show you a “4” sticker on top of the device’s actual number. After all, I was at the infamous E3 where a similarly astounding, Blade Runner-inspired first-person shooter debuted behind closed doors. Prey 2 made us wonder in 2011 whether we’d ever see its dramatic conversations and city-sweeping parkour work on a PC or console. But that version was eventually canceled in favor of a completely different reboot. So I’m inherently skeptical—and I was in no way impressed by the demo’s implementation of open-world driving, which looked rigid by default and a little too automated and glossy when V sat on her windowsill mid-drive to shoot at cars during a dramatic chase. That being said, CDPR could release this video as-is, admit it was completely faked, and still win a film festival’s “best CGI short-film” competition. It’s that enticing and rollicking. And the hints of a larger, darker story—of V watching a naked man walk out of her beautifully furnished apartment, of V sealing a gun-purchase deal by shoving a pistol into the seller’s neck, and of V facing off against that one “corpo” character in the demo’s final moments—make me believe that Cyberpunk 2077 has enough plot and world development on its side, even if the tech turns out to be smoke and mirrors. The demo ends with the corpo thanking V for her work and with V getting one conversation-wheel response: “you fucked us.” Our demo host picked it, and V laid into the corpo, who had asked us to pay for a gun from an underground arms dealer using a specific, tons-of-credits chip. “Your chip had the clap,” V shouts, at which point the corpo looks us dead in the eyes and makes her point very clear: that arms seller was totally disposable to V, as proven by how she killed the guy, right? Well, the corpo says, that’s how I see you. The corporation is the only one that rules in the end. And then this powerful woman gets into a vehicle and zips away. Every moment of the demo seemed to tease ideas and stories, as if CDPR really has made a Cyberpunk 2077 “bible” of lore and history. It takes a big bible to sew together potential loose ends in such a lengthy and seductive demo. And that fact might answer the question of why CDPR would debut so much wild content so far ahead of the game’s unknown release window: because it speaks to the exact kind of doubt that genre master William Gibson himself offered after the game’s shorter E3 2018 trailer emerged. 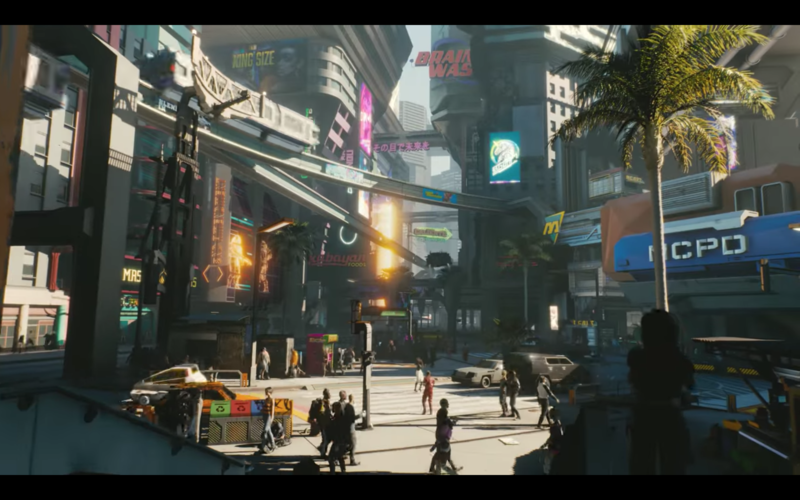 “The trailer for Cyberpunk 2077 strikes me as GTA skinned-over with a generic ’80s retro-future, but hey, that’s just me,” he wrote on June 10. And for everything wild and hard to believe about the demo, one thing it proved was that CDPR’s vision is a decidedly different one than Grand Theft Auto. Every NPC appeared to offer dialogue options. Every quest was teased with branching “be the criminal you want to be” options and tactics that were clearly visible on-screen. A truly Gibson-like future-crime society should push the world’s heel on the hero’s face—and force them to squirm out and overcome in the coolest ways possible. Based on what I saw, Cyberpunk 2077 just might deliver on that vision.